NETWORK FINALS: GRIMM gained 0.1 in final numbers. CABLE HIGHLIGHTS: Discovery’s GOLD RUSH owned Friday cable, with the entire primetime slate in the Top 4: GOLD RUSH itself up 0.03 to 1.34, an AFTERSHOW at 1.00, and GOLD RUSH: THE DIRT leading off the evening at 0.55. ESPN’s primetime Washington vs. Cleveland NBA game was at 0.59, with the late Atlanta vs. Lakers game at 0.51. Adult Swim’s CHILDRENS HOSPITAL, which just announced its upcoming exit, ticked up to 0.53. On Lifetime, BRING IT slipped 0.06 to 0.48. A pair of Disney Channel morning shows hit the Top 10: DOC MCSTUFFINS at 0.44 and SOFIA THE FIRST at 0.39. (Nickelodeon wasn’t far behind with a noon BLAZE & THE MONSTER at #11 with 0.34.) On HBO, REAL TIME WITH BILL MAHER lost a tick to 0.33, and VICE gained 0.02 to 0.20, with ANIMALS down 0.01 to 0.10. 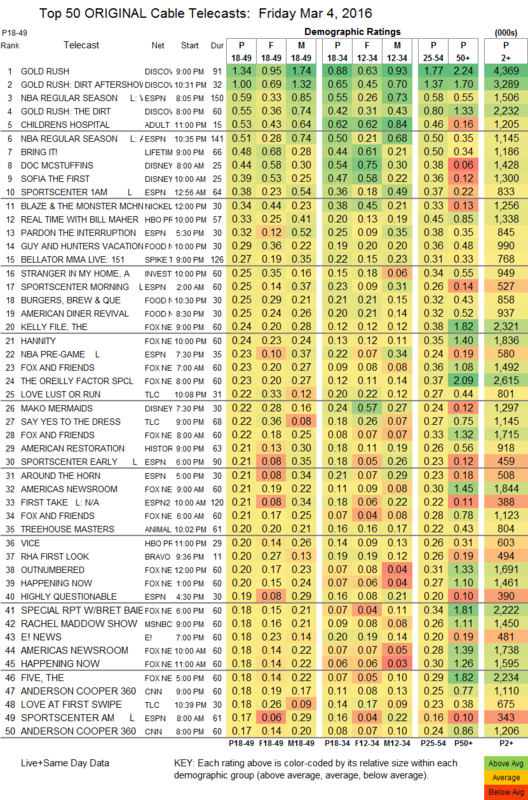 On Food Network, GUY & HUNTER’S EUROPEAN VACATION ticked down to 0.29, while BURGERS BREW & QUE and AMERICAN DINER REVIVAL were both at 0.25, respectively up 0.02/0.01. Spike’s BELLATOR MMA lost a hundredth to 0.27. On TLC, LOVE LUST OR RUN held at 0.22, SAY YES TO THE DRESS fell 0.02 to 0.22, and LOVE AT FIRST SWIPE remained at 0.18. History’s AMERICAN RESTORATION ticked up to 0.18, and MILLION DOLLAR GENIUS stayed at 0.15. 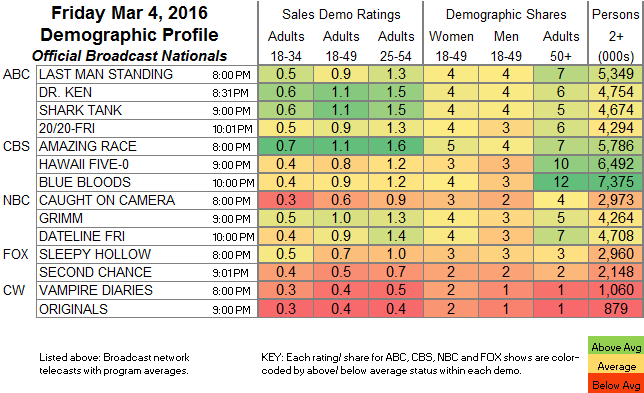 Bravo’s THE PEOPLE’S COUCH dropped 0.03 to 0.14.